NuMedica SacBoulardii DF is a dairy and lactose-free DNA-verified strain of Saccharomyces boulardii (SB) from the celebrated Institut Rosell. This strain of tropical yeast has been extensively researched by both U.S. and European universities for its healthful properties and ability to promote intestinal health. These university studies have been published in major scientific journals. NuMedica has partnered with Institut Rosell to design this advanced nutritional supplement that can promote overall intestinal health. NuMedica is one of the world's leading purveyors of nutritional supplements supporting a wide array of health and nutrition needs. With key natural ingredients, NuMedica's products have been designed to safely and effectively promote optimum health and nutrition. NuMedica's continued research and partnership with other leading organizations like Institut Rosell attest to its continued commitment to design the products that people need to support a myriad of health and nutritional needs. 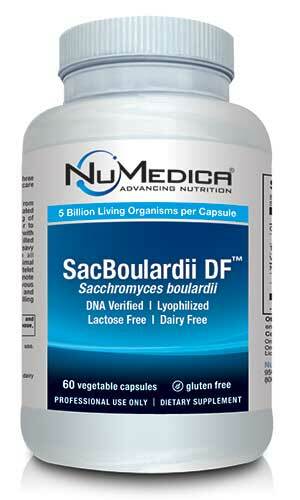 Saccharomyces boulardii is a strain of yeast that is often used as a probiotic for healthy patients. While this yeast should not be used individuals whose immune systems are suppressed, it can be quite effective for helping to treat people with gastrointestinal disorders or complaints. As a supplementary probiotic, NuMedica SacBoulardii DF with its active Saccharomyces boulardii can help promote an ecosystem filled with healthful microflora that complements gastrointestinal function. In short, probiotics are good bacteria that help protect the gastrointestinal tract from bad bacteria that cause illness and gastrointestinal complaints. What is interesting to scientists about Saccharomyces boulardii is that it is type of yeast that acts like a probiotic. For many years, doctors have prescribed this yeast to patients suffering from bouts of diarrhea. Saccharomyces boulardii helps to protect the intestinal lining of the gastrointestinal tract from potentially harmful pathogens. The ecosystem of the gut can be thrown off balance by any number of things-illness or even taking antibiotics for the treatment of an illness. Live cultures that work as probiotics help to restore healthful bacteria that are needed to protect the gastrointestinal tract from harmful bacteria and pathogens that will readily attack it. For gastrointestinal health and support, be sure to talk to your healthcare provider about taking NuMedica SacBoulardii DF. The DF stands for dairy-free. SacBoulardii is a lactose free, dairy free, DNA verified strain of Saccharomyces boulardii (SB). The DF is sometimes removed from the label printed on the bottle- not sure why but it does not affect the product.